The United Grand Priories of the Hospitaller Order of Saint Lazarus of Jerusalem are a confederation of independent Lazarite Grand Priories governed by the Supreme Grand Priory which is headquartered in Scotland, Great Britain. Unlike other similar organizations, it is assembled on an annual basis, and representatives of all the Grand Priories jointly decide on the challenges facing today�s Hospitaller works throughout the world. The history of the United Grand Priories dates back to the early nineties. By the 1990's members of Saint Lazarus, in the United Kingdom, who had been looking for a serious Hospitaller programme in which to participate, decided it was the time for a change. They sought a programme which would be devoted to working in an area not currently supported by any other chivalric organisation, and a programme which would highlight the Christian, charitable, and caring nature of the members of Saint Lazarus. Consequently a number of British past-members and high officers of the Paris Obedience decided, from 1st January 1995, to form a British chivalric and Hospitaller organisation to be known as 'The Grand Priory in the United Kingdom and Overseas of the Hospitaller Order of Saint Lazarus of Jerusalem'. This decision immediately removed them from any direct foreign authority, including any Grand Master. A meeting was convened in London on the 13th May 1999, which established the United Grand Priories of the Order of Saint Lazarus of Jerusalem. In this May meeting, England and Scotland formally passed the necessary resolutions for the establishment of the United Grand Priories, which, at that moment, was composed of The Grand Priory of England, Wales, Isle of Man and Channel Islands and The Grand Priory of Scotland. On the 23rd of August 1999 the Grand Council met and admitted the Grand Priory in Southern Africa. The same situation was very evident in other countries and islands, including Malta, Gozo, Italy, France, Greece and the English-speaking members of the Order in Tripoli, Libya. After an extensive recruitment campaign in the Mediterranean region, the Lazarite world eventually saw the formation of a separate Grand Priory wholly dedicated to the Mediterranean region, on the 15th of February 2004. In 2008, the United Grand Priories consecrated the Grand Priory of the Ukraine, with Chev. Anton Savvov KLJ being appointed as the first Grand Prior. As we have seen, to this end, a new 'international' body was established, known as 'The United Grand Priories of the Hospitaller Order of Saint Lazarus of Jerusalem'. Each Grand Priory is governed by a Council of Knights. The Grand Priory of the Mediterranean is represented in the Grand Council of the United Grand Priories by the Grand Prior, Mons. Anton Gauci ECLJ CMLJ and the Chancellor, Massimo Ellul GCLJ GCMLJ. October 2008, during the investiture of the Grand Priory at the Cathedral of Gozo, the Grand Prior of the Supreme Grand Priory of the Hospitaller Order of Saint Lazarus, H.E Richard Comyns of Ludston GCLJ announced the Chancellor’s elevation to Grand Chancellor of the Order and his being invested as Knight Grand Cross of the Order in the April 2009 investiture in Malta. The United Grand Priories are an ecumenical Christian organisation that sees its function as an opportunity to foster ever-stronger ecumenical bonds between the various branches of Christianity. To this end it hopes to encourage members and clergy from all parts of the Christian community to belong to the Order, and work together in harmony and understanding, under the banner of Saint Lazarus. The Hospitaller Order of Saint Lazarus of Jerusalem was a military, religious and Hospitaller Order of Chivalry, and bore no resemblance to modern-day historical or charitable organisations. It was military in that it played a military role from 1120 to about the beginning of the 16th century. Until 1291, its military activities were centred in the Holy Land helping to hold it for Christianity, while after its loss they were involved in the protection of the pilgrim routes, particularly of that to Santiago de Compostela. The military role was partly revived in the early 17th century when the Order maintained a squadron of ten frigates based at St Malo, manned by the knights, novices and chaplains. With the ending of the Order's naval activities in 1668, the military role was continued by means of its naval academy, and the ownership of a military school in Paris, which it held until the French Revolution in 1791. After the Crusading period, the Order's religious character was maintained by means of its chaplains, its Religious Protector, its Spiritual Grand Prior, its rules, services and traditions. Members were expected to live their lives in the spirit of ecumenical Christian charity. The majority of historians, however, agree that such claims of continuity from remote antiquity was in effect an apocryphal pretension so that the Knights of Saint Lazarus pass as the oldest of all the Orders, especially since they became, in a very short time, expert Hospitallers and carers of the ill, lepers and needy. Despite its subsequent military role, it remained primarily a Hospitaller Order, operating a worldwide network of hospitals and Lazar Houses, and sending aid to wherever there was sickness and suffering, maintaining or supporting leper hospitals, medical centres, ambulance units and various other humanitarian institutions throughout the world. The Order was chivalric in that it became a monastic Order of Knighthood in the early 12th century. Its ranks held those who were already knights or those of noble birth who received knighthood after entry into the Order. The Order always had the power of conferring knighthood on any person deemed suitable. This ancient prerogative was enshrined in the Act of 1624, which created the category of Knights of Grace, where nobility was not required. This power, to confer knighthood, remained unimpaired from the 12th century and needed no recognition for its validity, preceding, as it did, all secular knighthoods still surviving to this day. Apart from this knightly aspect of chivalry, it also implied that privilege went hand in hand with responsibility, to care for the sick and protect the weak. It was service without being servile, the use of one's effort and strength for the purpose of Christian and human charity. The Order was not a reward, but a commitment of service past, present and future, to carry out its aims, and to work for humanity in its name. Through the dedication of its knights and members, its nobility of purpose in caring for the sick, and its splendid history, the Order's traditions have survived intact throughout the centuries, and should continue so for centuries to come, as long as Christianity, and a need to help our fellow man, exists. The Grand Priory of the Mediterranean started its operations from the founding of the very first Commandery in Malta. It was very evident from the first days of this operation that there was indeed quite a good recruitment base in Malta for potential Lazarites working in true Hospitaller spirit and in transparent, hands-on, charity work. Malta is renowned as possessing a great sense of civic duty and the voluntary sector has always been very active when it comes to charity work and good causes. Thus, the first months of 2002 were spent organising a proper five year plan for what was supposed to be a simple target of a couple of Commanderies operating in Malta under the auspices of United Grand Priories. The first investiture was carried out in Malta on Saturday 4th May 2002 at Saint Paul's Anglican Cathedral in the capital, Valletta. The Grand Chancellor, assisted by the Order's Sub-Prelate, the Reverend Fra Michael St. John-Channell, invested the first ten members of the Commandery of Malta and appointed Confrere Massimo Ellul as Commander of the Commandery. By September of 2002, it was very evident that the response to this new chivalric organisation was overwhelming. The Commander, by means of his close association with one of the leading ecclesiastical pillars in the sister island of Gozo, the Reverend Professor Monsignor Anton Gauci, organised a synergic link with the Chapter of the beautiful and impressive Cathedral of our Lady, in Victoria, Gozo, which would thereafter be the seat of investitures and spiritual activities of the Order in the region. The United Grand Priories, in reaction to the increasing membership in the Order, sanctioned the establishing of a Grand Commandery of Malta, composed of two Commanderies, named La Vallette and Cotoner respectively. All Commanderies operating from Malta carry the name of an illustrious Grand Master of the Knights of Malta. Simultaneously, the Grand Commandery of Malta also boasted forty energetic youths, organized into a specific division of the Order named 'the Young Lazarites'. Although too young to be regarded as postulants to the Order, this dynamic group was essential in fundraising events of the Order and were specifically recruited to provide a long-term pool of recruitment to the Order. The presence of this large group of youths, all eager to assist and help in charitable events instilled a very strong sense of the Order becoming a large family. By October 2003, the membership of the Order in Malta had grown such that a third Commandery was petitioned for, and obtained. The new Commandery was given the name of the illustrious Grand Master De Rohan. After a number of trips by the Grand Commander to Tripoli, Libya, a recruitment drive amongst the English speaking expatriate community residing in Tripoli was also registered, which meant the inevitable petitioning of yet another independent Commandery named the Commandery of Tripolitania. On the 28th of February 2004, the third investiture of the Order in the region, at the Cathedral of Our Lady, in Victoria, Gozo, saw the official establishment of the Grand Priory of the Mediterranean of the Hospitaller Order of Saint Lazarus of Jerusalem. Since 2004 the Grand Priory of the Mediterranean has grown tremendously, including an increase in charitable donations, an increase in ctivities which can be viewed on this web site and an increase in membership. 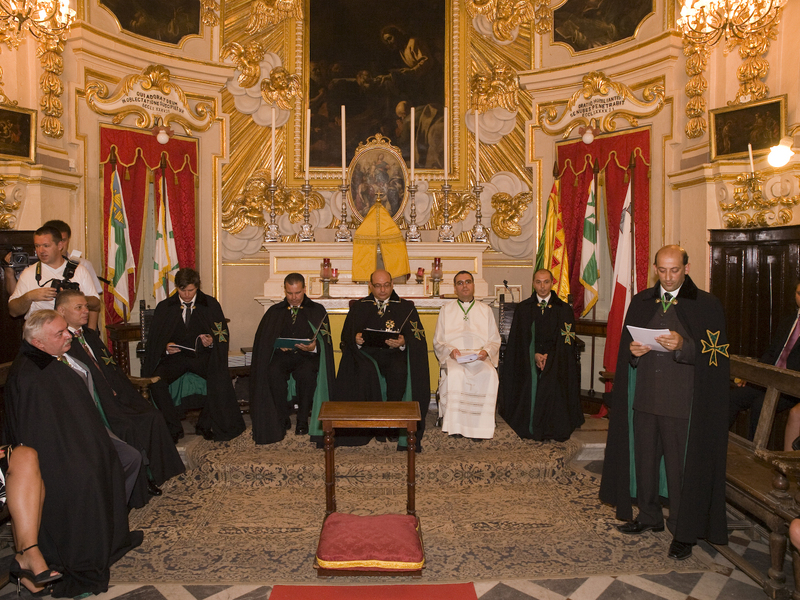 By December 2006, the Grand Priory of the Mediterranean manifested a strengthening of its international Mediterranean dimension and underlined its administrative structure in keeping with its increased philanthropic and chivalric activities. 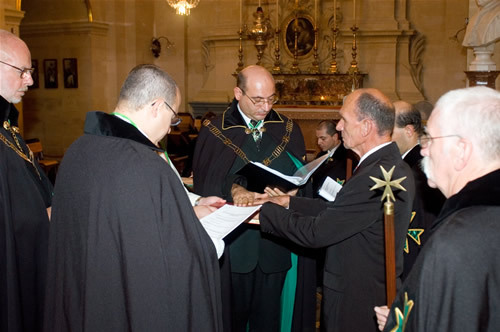 The Grand Priory of the Mediterranean conducted, up to the end of 2008, fourteen investitures, including investitures at the spiritual centre of the Grand Priory, the Cathedral of Gozo, the Anglican Cathedral of St. Paul’s in Valletta, Malta, the Saint Andrews Scots Kirk in Valletta, Malta, Villa Diodoro in Taormina, Sicily, at the French castle Le Chateau de la Palisse, which is the headquarters of the Grand Commandery of France under the Grand Priory and at the Anglican Church in Athens, Greece. These investitures not only highlight the increase of chivalric activity of the Grand Priory but also the ecumenical aspect of the Hospitaller Order as a whole. The Grand Priory in 2008 was very proud in proposing the setting up of the Grand Priory of the Ukraine to be part of our international confraternity and in 2009 will be also proposing the consecration of the Grand Priory of Russia. The Grand Commandery of Malta. In April 2010, the Grand Priory of the Mediterranean will be holding its 18th investiture in the Basilica of Saint Dominic the Great, in Malta’s capital, Valletta. It is also envisaged that in the year 2010, an international chivalric symposium will be held under the auspices of the Grand Priory with a number of eminent personalities specializing in this field being invited for this international gathering. To date, thousands of dollars worth of assistance has been given to a number of charities and organisations, including a very close link with the Malta Hospice Movement. October, 2004 saw the creation of the Saint Lazarus Hospice Foundation in Malta, and this charitable vehicle has now provided the infrastructure needed for the Grand Priory of the Mediterranean to carry out its work in a more streamlined fashion. The Grand Priory anticipates an increase in the coming years of local and international charitable and hospitaller events that will make all Saint Lazarus members, both past and present, very proud. The theme of this Grand Priory continues to be one of "hands-on participation". i) The letters specified above after each Grade may properly be used by those to whom they apply for the purpose of indication their Grade in the Order in the context of any occasion or matter connected with their participation in the work of the Order, or for inclusion in any publication of a biographical nature but, subject to this, admission, attachment, or promotion to any Grade of the Order or privileges derived therefrom of wearing the insignia appertaining or belonging thereto shall not confer any rank, style, title, dignity, appellation or social precedence whatsoever. ii) A minister of the Christian religion who is admitted as a Member of Grade VIII or VII of the Order may if he so desires be termed a Sub-Chaplain (Sub-ChLJ) or Chaplain (ChLJ) respectively; Grade VI / V may be termed a Senior Chaplain (SChLJ); Grade IV / III may be termed Sub-Prelate or Ecclesiastical Commander (ECLJ); Grade II / I may be termed Prelate or Ecclesiastical Grand Cross (EGCLJ). The Chaplain General and the Almoner of the Grand Priory shall be ministers of Episcopal rank or of other eminent status in the Christian Church and shall be a Member of Grade II / I of the Order. No Member of the Order may be awarded a ‘Merit’ rank higher than the rank he or she holds in the Order. A person, not being a Member of the Order, having been awarded a Grade in the Companionate of Merit will have his or her name recorded on a list which shall be maintained by the Registrar General. The Knights in Council, of a Grand Priory, are able to bestow an award for special meritorious service known as the ‘Oak Leaf of Merit’. which can be awarded by the Commander of a Commandery without reference to the Knights in Council. which can be awarded by the Commander of a Commandery if this recommendation is first approved by the Knights in Council. which can only be awarded by the Knights in Council. All the awards may be granted by the Knights in Council.